This chapter highlights the importance of e-procurement and the barriers affecting its widespread adoption in the context of small and medium enterprises. 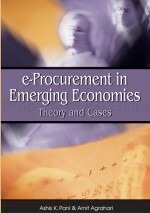 The chapter takes a technical perspective and critically analyzes the importance of information systems in the procurement domain and the integration challenges faced by SMEs in today’s digitally networked economy. Next, the role of XML-based Web services in solving the integration challenges faced by SMEs is discussed. Subsequently, a procurement transformation framework enabled by Web services which provides a clear methodology of the way in which information systems should be introduced in the procurement domain is discussed. The chapter concludes by a discussion of the measures that must be undertaken by various stakeholders like the government and universities in increasing the awareness levels of SMEs to the latest e-business mechanisms.